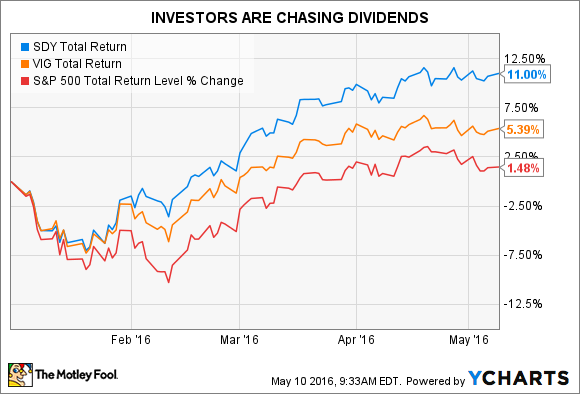 Dividend Stocks: Where Will the Next Dividend Increases Come From? Ultra-low bond yields are pushing investors into dividend stocks, but are they piling in at the end of the cycle? U.S. stocks are higher in late morning trading on Tuesday, with the S&P 500 (SNPINDEX:^GSPC) and the Dow Jones Industrial Average (DJINDICES:^DJI) (DJINDICES: $INDU) up 0.88% and 0.99%, respectively, at 11:38 a.m. ET. Investors continue to adapt to a confounding world in which roughly $10 trillion in developed market government debt is offering a negative yield, per rating agency Fitch. Dividend shares offer an immediate solution to their dilemma. The U.S. market does not exhibit this malady, but government bond yields are nevertheless lower than the dividend yield on the benchmark S&P 500 index -- currently 2.18% -- for maturities out to 20 years, according to data from Bloomberg. SDY Total Return Price data by YCharts. The S&P Dividend ETF (blue line) includes companies that have a history of increasing dividends for at least 25 years consecutively; the bar for inclusion in Vanguard's ETF (orange line) is lower, at just 10 years. Owning a portfolio of high-quality dividend payers with the intent to hold them over many years is an excellent long-term investing strategy (particularly when you can do so at low cost -- Vanguard's expense ratio is a bare-bones tenth of a percentage point). However, like any other strategy, it exhibits some cyclicality, and one cannot help but think that we are now closer to the end of the cycle than to the start. The investors clamoring for dividends look like Johnny-come-latelys. Indeed, the dividend payout ratio on the S&P 500 has been increasing since the fourth quarter of 2013 to hit 54.8% last quarter -- the highest level since the second quarter of 2008. Meanwhile, the index's operating profit margin has been declining consistently since the third quarter of 2014, to 11.9% last quarter. Since dividends are paid out of operating cash flow (dividends that are sustainable, that is), the divergence between the payout ratio and profit margin cannot widen indefinitely. The energy sector is an extreme example of this: It has been operating at a loss for the past three quarters, yet it sports a mouthwatering dividend yield of 3.18%. Clearly, that state of affairs is unsustainable; either the sector gets back to profitability, or companies will have to begin cutting dividends. None of this is to say that one can't continue to invest in dividend stocks -- if one is prepared to own them over the long haul. In the short term, rising dividends will soon require rising earnings, which, in the current economic environment, looks trickier to achieve than simply lifting the payout ratio.